As you know, a website consists of several pages. How do you go from one page to another? Using links of course! So how to create links between our pages is what we are going to learn to do this chapter. I guess you all know what a link is: it's a text that you can click to go to another page. You can make a link from a pagea.htmlto a pageb.html, but you can also make a link to another website (for example,http://www.google.com). We'll see that both cases work in the same way. It's easy to recognize the links on a page: they're written in a different way (as default, in blue underlined) and a cursor which looks like a hand appears when you point to it. I suggest you try to encode a link that takes you to Google, as shown in the next figure. To insert a link, the tag that we're going to use is very easy to remember: <a>. However, an attribute, href, to it to indicate the page the link should lead to. By default, the link is highlighted in blue. If you've already opened the page, the link is displayed in purple. We'll see how to change this appearance when we study CSS. If you want to make a link to another site, you can just copy its address (called a URL) inhttp://. Note that some links sometimes start withhttps://(secure websites) or other prefixes (ftp://, etc.). If you make a link to a website that has an address that is a little strange with occurrences of '&', as in: http://www.site.com/?data=15&name=mateo21, you will have to replace every "&" by "&amp;" in your link as follows: http://www.site.com/?data=15&amp;name=mateo21 . 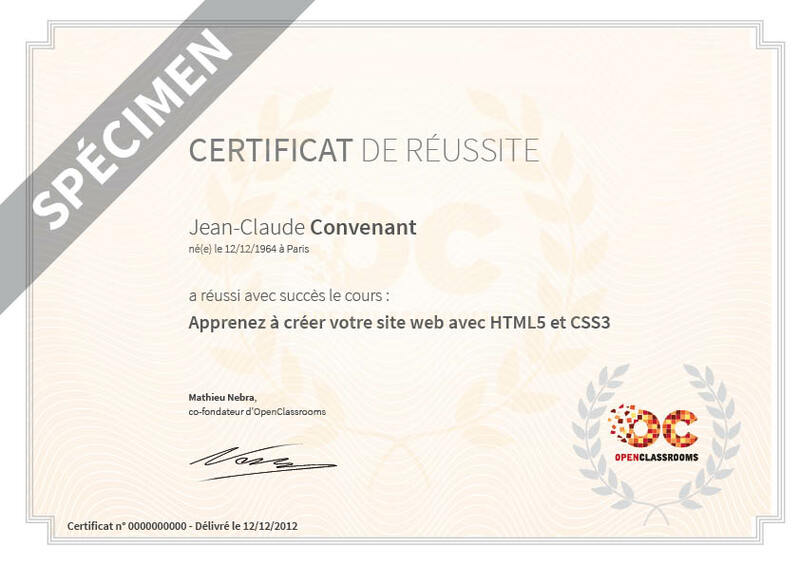 You will notice no difference, yet this is necessary if you want your web page to be correctly constructed in HTML5. The links that we have seen are called absolute links since the full address is shown. We are now going to see that we can write the links in a somewhat different way which will be useful for making links between the pages of our website. We have just learned how to create links to existing websites. But I'm sure you'd like to make links between the pages of your website, right? Yes, how exactly do I make a link to another page on my website? I don't know itshttp://…… address as I've only just started to create my website here! I don't have an address. Indeed, for the time being, you're creating your website on your computer. You're the only one who can see it and it doesn't yet have a "web address" starting withhttp://like most websites. Fortunately, this won't prevent us from working. To begin with, we're going to create two files corresponding to two different HTML pages. As I'm very inspired, I propose to call thempage1.htmlandpage2.html. We'll thus have these two files on our hard disk in the same folder (see next figure). How do you make a link from page 1 to page 2 without having an address inhttp://? In fact, it's easy: if both files are located in the same folder, just write the name of the file you want to move to as the target link. For example:<a href="page2.html">. This is said to be a relative link. Here's the code that we're going to use in our filespage1.htmlandpage2.html. 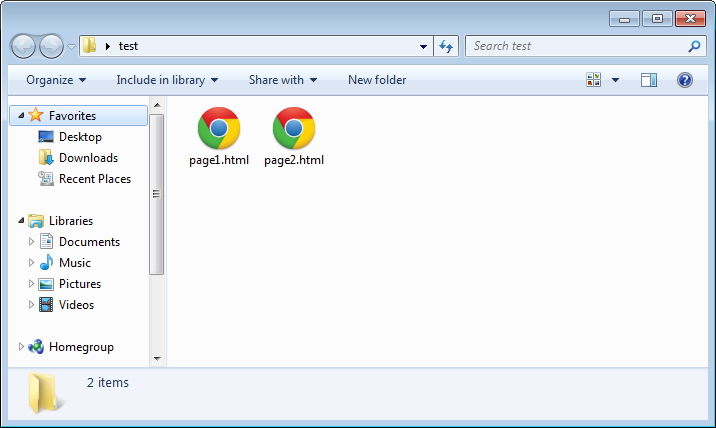 Things get a bit more difficult if the pages are located in different folders. Ideally, they shouldn't be too far away from each other (in a subfolder, for example). 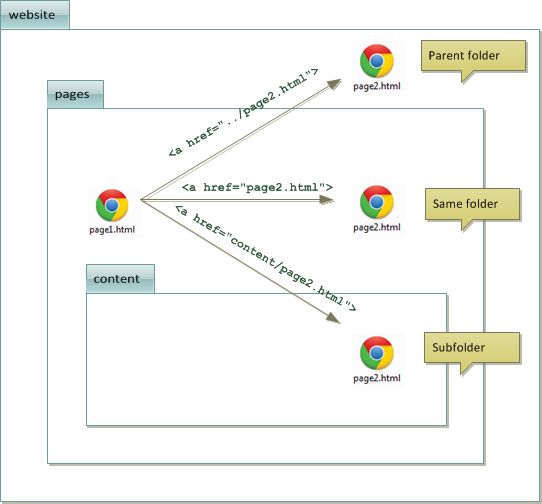 Let's imagine thatpage2.htmlis located in a subfolder calledcontent, as in the next figure. 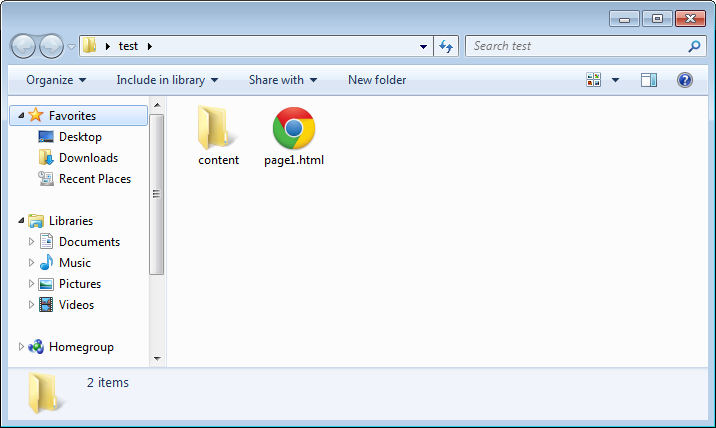 And what if the file is not located in a subfolder but in a "parent" folder? What do you do then? Relative links are not very complicated to use once you've understand the principle. To know how to write your link, just look at the "folder level" in which your target file is located. The next figure summarizes the various possible relative links. An anchor is a sort of reference point that you can put in your HTML pages when they are very long. Indeed, it may be then be useful to create a link to a point further down the same page to allow visitors to jump directly to the part they are interested in. To create a new anchor, just add theidattribute a tag which will then act as a reference point. It can be any tag, such as a title, for example. Normally, if you click the link, it will take you further down the same page (provided the page has enough text for the scroll bars to move automatically). If nothing happens when you click on the links, this means that there is not enough text. In this case, you can either add any old text to the page so that it has (even) more text or reduce the size of your browser window to display the scroll bars on the side. Theidattribute is used to give a "unique" name to a tag, to use it as a reference. And believe me, you haven't heard the last of this attribute. Here, it is used to link to an anchor, but in CSS, it will be very useful to us to "mark" a specific tag, as you'll see. However, avoid creating ids with spaces or special characters. Wherever possible, simply use letters and numbers so that the value is recognized by all browsers. OK, be warned. This is really going to be a megamix! The idea is to make a link that opens another page AND that takes you directly to an anchor located further down on this page. In practice it's fairly simple to do: just type the page name, followed by a hash character (#), followed by the anchor name. ... will take you to the pageanchors.html, directly to the anchor calledrollers. Here, I'm going try to show you a few practical examples of using links. For example, did you know that it's very easy to make links that start a download? That create a new e-mail? That open a new window? No? Well, we're going to have a look at all that here. You can use thetitleattribute which displays a tooltip when you point to the link. This attribute is optional. You should obtain a result similar to the next figure. The tooltip can be useful in providing visitors with information even before they have clicked the link. Depending on the browser configuration, the page will open in a new window or a new tab. You can't choose between opening a new window or a new tab. Note, however, that it is not recommended to overuse this technique as it disrupts browsing. Visitors can decide for themselves whether they want to open the link in a new window. They can press Shift + Click on the link to open it in a new window or Ctrl + Click to open it in a new tab. So you just need to start the link bymailto:and enter the email address at which you can be contacted. If you click the link, a new blank message opens, ready to be sent to your email address. Many of you must be wondering how this works for downloading a file... In fact, the procedures is exactly the same as for linking to a web page, but this time indicating the name of the file to be downloaded. That's all! As the browser sees that there is no web page to be displayed, it will start the download process when user clicks on the link. Links are used to move from one page to another and are as default in blue underlined text. To insert a link, use the<a>tag with thehrefattribute to indicate the address of the target page. Example:<a href="http://www.google.com">. You can make a link to another page in your website simply by writing the file name:<a href="page2.html">. Links can also be used to jump to other places on the same page. You have to create an anchor with the id attribute to "mark" a place on the page and then make a link to the anchor like this: <a href="#anchor">.